Clark, T.D., Roche, D.G., Binning, S.A., Speers-Roesch, B. and Sundin, J. 2017. Maximum thermal limits of coral reef damselfishes are size dependent and resilient to near-future ocean acidification. Journal of Experimental Biology 220: 3519-3526. Citing the most recent United Nations report of the Intergovernmental Panel on Climate Change (IPCC) (Pörtner et al., 2014), Clark et al. (2017) state that "theoretical models predict that ocean acidification, caused by increased dissolved CO2, will reduce the maximum thermal limits of fishes, thereby increasing their vulnerability to rising ocean temperatures and transient heatwaves." However, they lament the fact that "insufficient attention has been focused on testing the prediction that thermal limits will be negatively affected by end-of-century levels of PCO2," adding that "it is prudent to first quantify whether elevated PCO2 does indeed impact thermal limits." And surely such quantification is prudent, for without the rigorous testing of theoretical hypotheses, scientific truths cannot be established! Thus, it became the objective of Clark et al. to examine the correctness of this aspect of the ocean acidification hypothesis, i.e., whether or not elevated PCO2 negatively impacts a fish's ability to cope with high temperatures. In performing their analysis, the five researchers collected both juvenile and adult specimens of three damselfish species from the reef environment off Lizard Island in the northern Great Barrier Reef (14.67°S, 145.47°E). The species included spiny chromis (Acanthochromis polyacanthus), humbug dascyllus (Dascyllus aruanus) and white damsel (Dischistodus perspicillatus). One to two days post capture, the PCO2 contents of half of the holding tanks were raised to approximately 1000 µatm, about twice that maintained in the remaining control tanks. Then, following a 9-18 day acclimation period (which period was more than double the acclimation time used in most all other ocean acidification studies), the critical thermal maximum (CTmax; the temperature at which motor function is lost -- a measure of resilience to heat waves and climate warming) of the fish were determined by raising the temperatures of the tanks 0.5°C every 30 minutes until all fish had reached their CTmax. Results of the study are illustrated in the figure below, where it was found, in the words of the authors, that "end-of-century levels of PCO2 do not compromise the maximum acute thermal limits of coral reef damselfishes." Indeed, not only did ocean acidification (OA) not compromise CTmax, it was shown to significantly enhance it in both D. Perspicillatus and A. polyacanthus by 0.16°C and 0.21°C, respectively (CTmax also increased in D. aruanus, but that increase was not statistically significant). Furthermore, Clark et al. report that "early-stage juveniles were equally as resilient to CO2 as larger conspecifics, and CTmax was higher at smaller body sizes in two species," which finding they say "conflicts with the established belief that larval and early-stage juvenile fishes are especially sensitive to environmental stressors as a consequence of underdeveloped physiological/regulatory systems." In light of their several findings, Clark et al. thus write that "the heightened thermal limit and equivalent PCO2 tolerance of small individuals [observed under OA] provide evidence of an unexpected capacity to maintain physiological homeostasis from a young age," concluding that "ocean acidification will not impair the maximum thermal limits of reef fishes." And with their study results, they thus highlight "the critical role of experimental biology [i.e., real-world data] in testing predictions of theoretical models forecasting the consequences of environmental change." Figure 1. 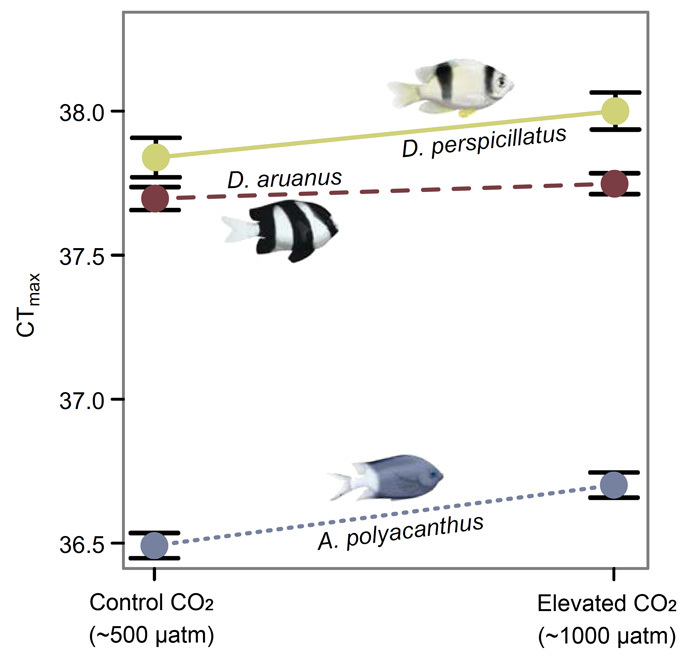 CTmax of three damselfish species maintained in present-day (~500 µatm) or end-of-century (~1000 µatm) PCO2 conditions. Acanthochromis polyacanthus is represented by the dotted line, Dascyllus aruanus by the dashed line and Dischistodus perspicillatus by the solid line. Error bars are 95% confidence intervals. Adapted from Clark et al. (2017). Pörtner, H.-O., Karl, D.M., Boyd, P.W., Cheung, W.W.L., Lluch-Cota, S.E., Nojiri, Y., Schmidt, D.N. and Zavialov, P.O. 2014. Ocean systems. In Climate Change 2014: Impacts, Adaptation, and Vulnerability. Part A: Global and Sectoral Aspects. Contribution of Working Group II to the Fifth Assessment Report of the Intergovernmental Panel on Climate Change (ed. C.B. Field, V.R. Barros, D.J. Dokken, K.J. Mach, M.D. Mastrandrea, T.E. Bilir, M. Chatterjee, K.L. Ebi, Y.O. Estrada, R.C. Genova et al. ), pp. 411-484. Cambridge, United Kingdom and New York, USA: Cambridge University Press.